Pixelnicks has confirmed that it will be bringing the platformer Eagle Island to Switch. It was previously only confirmed for PC. Eagle Island may actually end up on Switch at the same time as the PC version, though that depends on how easy it is to align them. Although Pixelnicks is currently targeting a February launch, it could slip into March depending on how long it takes to get through Nintendo’s approval process. Explore the avian world of Eagle Island with Quill and one of his loyal owls, Koji. Discover lush forests, treacherous caverns and uncover the ruins of long lost civilizations. Finally, confront the gargantuan deity, Armaura, in a desperate attempt to rescue Ichiro from her clutches. 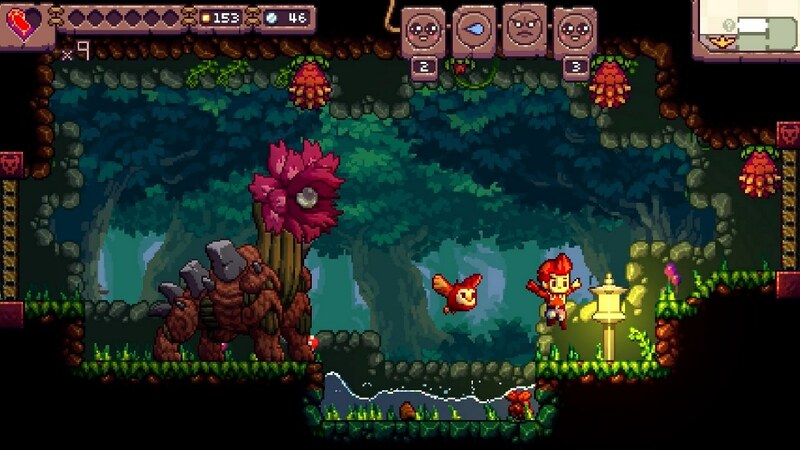 With its falconry-based gameplay within uniquely generated worlds, Eagle Island is set to a beautifully modernized pixel art aesthetic and provides a breath of fresh air to the platforming genre. Taking inspiration from the roguelike and metroidvania genres, players of Eagle Island can enjoy either short runs or a longer story based experience. – Story, Roguelite and Speedrun modes. – Fully procedurally generated worlds. – 85 different perk abilities to mix up the gameplay each run. – Magical feathers transform your owl into elemental forms. – 16 beautiful environments to explore. – 12 huge boss battles. Quill’s arsenal of solo moves consists simply of running, jumping and the occasional ledge grab – the game keeps to its classic 16-bit inspiration. Launch attacks with Koji in 8 directions using the D-pad-like aiming controls. Hit enemies in quick succession to earn greater rewards from combos. Miss an attack and you’ll be forced to wait longer for Koji to return. If Koji is attacked or captured, Quill will be briefly defenceless and must take evasive action whilst vulnerable! Eagle Island was supported by 1,291 backers on Kickstarter.